It is only a few weeks now until the Great Glen Ultra (GGU). I found in the fling that knowing sections of the course helped a lot mentally and, conversely, the sections I hadn’t run before were my mentally toughest parts of the race. With this in mind I teamed up with a friend of mine from the village to head north for a day taking in what we could of the tougher sections of the course. My original plan was to run the last 15 to 20 miles of the course. The GGU is 72 miles long, so I figured that finding somewhere I knew 20 miles from the end would be a good mental crutch to see me through in the hardest part of the race. After some discussion though we decided to do a section from Invermoriston to Drumnadochit. I’m very glad we did. Notice the more spikey bits on the first hump? We certainly did! As it turns out, the route is amazing. The trail is exceptionally well made and perfectly signed with lovely bright blue markers at any point of intersection. 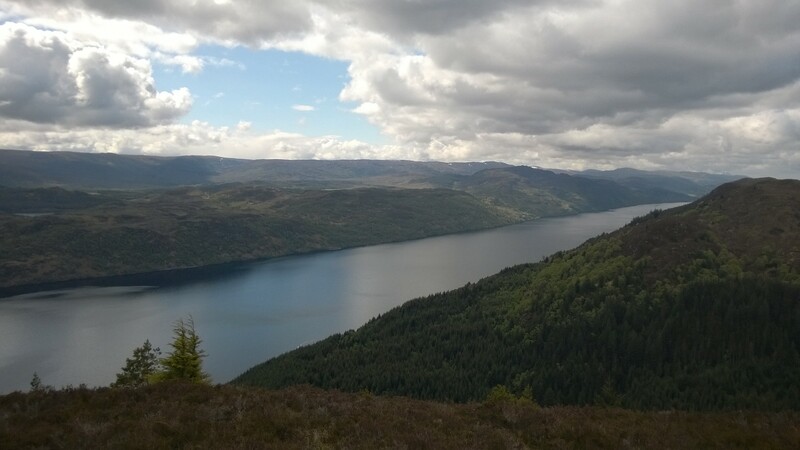 The weather was perfect and as we reached the highest point on that elevation profile, the views back down Loch Ness were worth the days effort in themselves. This section comes after what look like comparatively flat sections in the race but quite a distance in after the start in Fort William. The trail up from Invermoriston takes an immediately steep climb on an access road before heading into the forest on prepared trails. The ups and downs reminded me of the roller coaster section of the WHW near to Crianlarich and, given the distance in the race, are likely to have a similar mental and physical effect. At least now I know it is coming and prepare for it during the race. By the end of the day yesterday, I was buckled I have to admit. My legs were still slightly tired after last weeks Edinburgh marathon and it was a pretty warm day so water intake was high. I’m really looking forward to the race now though. I think a slow plod out from the start to Fort Augustus, saving as much as I can for those hills we found yesterday before a final 12 miles into Inverness after Drumnadrochit. Should be fun!